There are two famous 3 pole diode ladder lowpass filters, one of them was in a little silver box of a synthesiser with integrated sequencer that was used to make "Acid Tracks" and the other one was was in a big suitcase of a synthesiser with a silver faceplate and semi- integrated sequencer that was used to make tracks on acid often. this is the latter. I'm not going to name any names here, but I'm hoping I don't have to mention any voltage controlled studios or electronic music studios to establish the lineage of this filter topology. I can't promise this thing will make Sea Devils appear on your lawn or models of airplanes fly from one side of the stage to the other, crashing into a papier mache sun at the end of your song, so please don't be offended if these things fail to happen while using the filter, presuming you'd want to own one. 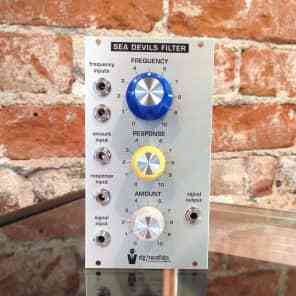 An Eurorack-compliant version of this module is available from Analogue Haven.